Yellow males available. Ready June 2nd. Wormed every 2 weeks and first shot. Exposed to birds and water. Dam Waterway's Best Bet Tournament dog placing in National Finals with a very stylish point. Her sire is a 5X National Champion and has a litter mate that is a 2X National Champion on the tournament circuit. Litter mate is 2017 Pheasants Forever Champion. 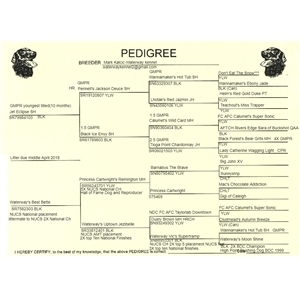 Bred by Hall of Fame breeder with over 30 Champion titles and 4 National Champion titles. I bred this litter for a pup for myself. Both sire and dam have all health clearances.. You can go to Facebook to waterway kennel and see more pics than you probably need to.